in kids' rooms- a little inspiration on September 02, 2012 . Let's face it. Have kids. Have clutter. So how about some inspiration for storage with style on a rainy Sunday, for what better day could there be for clearing up? One post will just not be enough to share even a teeny fraction of the great ideas out there, so I'll come back on the next rainy Sunday with another selection. Therefore, for starters only, today's Storage With Style theme is colourful, modern storage for large rooms, with inspirational images #1 to #5. These cube walls have been custom-made, lovingly crafted by skilled cabinet-makers in a mill workshop, with much attention paid to size and spacing and to giving them clean lines and a sharp painted finish. Sadly, I suspect a wooden DIY version would look awful, unless you are also a skilled carpenter. But, by using manufactured cube boxes hung in a similar way, it should be possible to recreate the overall look of either of these designs, shouldn't it? I fear, however, that finding corner boxes of the type in the first image could be difficult, and I think it's these that make the turn of the corner so integrated, and integral, to the design. Using a bookcase or shelving system for more than books is a great way to organise bits and bobs and to keep everything visible. But notice how uncrowded this is, which is why it manages to look artfully displayed rather than just shelved. I'm in two minds about the coloured back-board, perhaps because these particular colours aren't my thing (for if I imagine it in colours I'm fond of, I think it would look great). Keeping the surrounding wall colour either neutral or else very well co-ordinated, and flooring simple too, is, to my mind, key to making this work, otherwise it would be just another element fighting for attention, adding to the sense of clutter rather than minimising it. What I really like about this is the creation of both storage and a seat on a wall that would otherwise be pretty dead space. Not quite sure how kids would reach the upper shelves though (mind you, that's true of the images above too). Adding colour with just a few simple pieces, whilst keep everything else white or neutral actually makes it feel like a colourful room, whilst remaining very easy on the eye. Modern Kids design by San Francisco ArchitectFeldman Architecture, Inc.
Rather than filling space and blocking walls and light with cupboards and bookcases, I really like the idea of this: a huge bench seat which, presumably, could have loads of storage within. 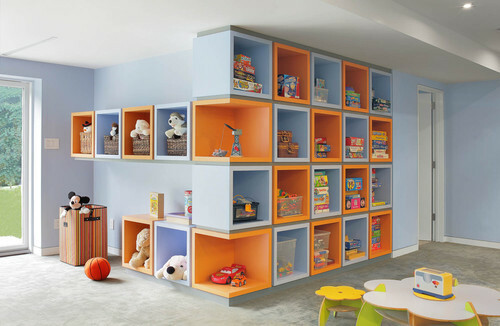 A take on this kind of design would create a lovely modern space for a large family room or as a "playroom" for older kids. Ahh, the sun's come out just as I've reached #5, so my rainy Sunday has come to an end. Sadly my clutter remains in place. How about yours?